General Masaharu Homma employed air and ground assets in an unexpectedly rapid conquest of the Bataan Peninsula in the spring of 1942. 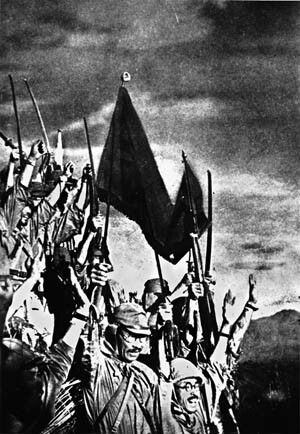 Following their impressive string of victories in Malaya, Hong Kong, Burma, the Dutch East Indies, and the Philippines, it appeared that the Japanese were invincible in the early days of World War II. By the spring of 1942, the Japanese had driven the American and Filipino defenders of the Philippines to the Bataan Peninsula and the brink of total defeat. Still, they believed that it would take a major offensive to overwhelm the defenders. This belief actually forced them to design and successfully launch what could be called a near textbook version of the German blitzkrieg, surprising, cutting off, isolating, and bypassing enemy strongpoints. So effective was the campaign that twice during what turned out to be a six-day battle, offensive operations actually had to be halted to allow tanks and vital supplies to catch up. The fact that the starving, emaciated, poorly equipped U.S. troops on Bataan were in such dire straits that they would never been able to stop the Japanese, blitzkrieg or not, is not pertinent to the story. Nor is the fact that Japanese General Masaharu Homma anticipated it would take a month to capture Bataan and that his decision to attack Mount Samat, the strongest position on the U.S. line, was a bold one. The plan of attack was central to the rapid success. It was one that would have made German General Heinz Guderian, known to history as the “Father of the Blitzkrieg,” proud. The U.S. defensive dispositions on Bataan left little doubt as to the focal point of the Japanese attack. Nearly the entire western half of the line, manned by troops of the U.S. I Corps, encompassed jungle so dense that it would not only neutralize the effects of Japanese air superiority but also swallow up an invading army within its roadless confines. In contrast, with the exception of its most dominating feature, 300-foot Mount Samat, the eastern half, defended by II Corps, offered an open, jungle-free approach to its gently rising northern slopes. The area was accessible to the trails that flanked both the eastern and western sides of the mountain. 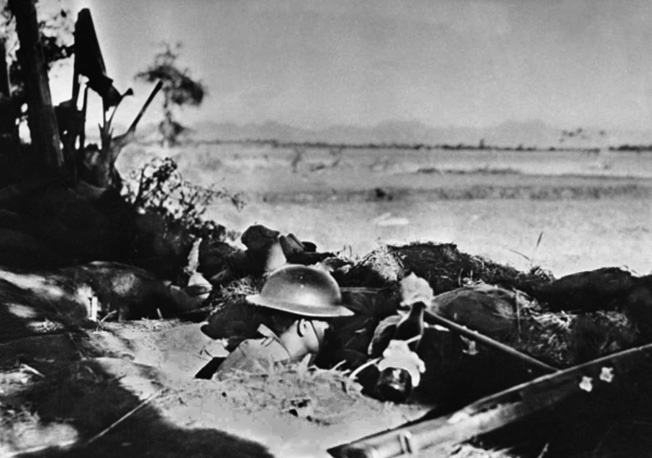 Wearing the World War I-style doughboy helmet, an American soldier crouches in his foxhole on Bataan in April 1942. Making use of every available weapon, this soldier has an improvised Molotov cocktail at the ready to hurl against the advancing Japanese. General Homma chose to launch his attack against Mount Samat, which he wrongly anticipated would take one week to capture, for two reasons. First, the Americans would least expect a frontal assault against the high ground that dominated the surrounding countryside. Second, with Mount Samat in Japanese hands artillery observers would be in position to direct fire for the primary assault down Bataan’s east coast. Prior to launching their assault on the mountain itself, the Japanese needed to gain control of three key trails, numbered 4, 6, and 429. Combined, these three trails encircled the footprint of Mount Samat. Complete Japanese air superiority allowed the attackers to bomb and strafe virtually at will. Increasing air operations were the only indication that the renewal of Japanese offensive operations were imminent. Otherwise, there was little indication of exactly where or when the Japanese would strike the American line. To beef up the squadrons of light bombers and fighters already operating in the area, the Japanese brought in two heavy 60-plane bombardment units from Malaya and Indochina, plus two squadrons of Mitsubishi G4M Betty bombers and a squadron each of carrier-based bombers and Mitsubishi A6M Zero fighters. On March 25, the opening day of the pre-attack phase of the battle, Japanese bombers and fighters attacked targets without pause. The Japanese usually paused for three hours at midday; however, on this date they were literally in the air from dawn to sunset bombing and strafing U.S. frontline and suspected artillery positions. For the next eight days, the cycle was repeated. On April 2, 1942, the day before the scheduled opening of the ground attack, 82 Japanese bombers pounded the forward slopes of Mount Samat, while fighters and dive bombers, directed by ever present spotter planes, made life miserable for the Americans and Filipinos squeezed into the defensive pocket on Bataan. As with the German blitzkrieg, one of the major contributors to the success of the air phase was the use of spotter planes, whose accurate observation of American positions almost totally neutralized the effectiveness of U.S. artillery. Every time a 155mm or 75mm gun fired, coordinates from their smoke trails were radioed to either a patrolling fighter or bomber, which usually executed a quick and deadly response to the message. A flight of Mitsubishi Ki-30 light bombers, codenamed Ann by the Allies, execute bombing runs against American and Filipino positions on the Bataan Peninsula. For the artillery phase of the attack, the Japanese had close to 200 weapons, of which nearly half were heavy 150mm to 240mm guns. Most of these heavy guns were positioned within a rectangular, 41/2-square mile area west of Balanga, a mere three miles from U.S. lines and the forward slopes of Mount Samat. To help conceal the scope and direction of their planned assault on Mount Samat, the Japanese limited their pre-attack artillery concentrations to eliminating U.S. artillery positions, the general disruption of troop movements, and destroying enemy command posts, communications, and defensive positions. The third and perhaps most important pre-attack effort was to secure both flanks of the operation from possible counterattacks against the center or main focal point of the assault. Threats to both the east and west sides of the mountain would also force the defenders to direct their attention away from the main objective, thereby weakening the center. The Japanese preparations began in earnest on March 31, three days before the main effort, when the Japanese 16th Division to the west and the Nagano Detachment to the east began their operations. The 16th Division’s job was to engage the I Corps from its eastern boundary with the II Corps across its entire front to the west coast. At the same time, to further tie down and decoy the defenders, Japanese warships began shelling U.S positions from the South China Sea. While the 16th was keeping the I Corps occupied, the Nagano Detachment, made up of some 4,000 men from the 21st Division, began pushing down the East Road, while also creating a diversion with the feint of an invasion from Manila Bay south of the U.S. line. 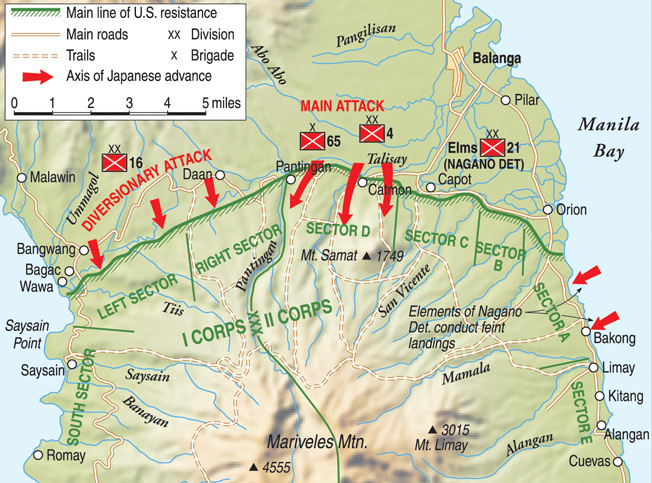 Utilizing a coordinated plan of attack, Japanese ground forces executed assaults against American and Filipino defenses on the Bataan Peninsula from three directions. Japanese artillery and aircraft joined in the offensive action, nearly achieving the shock effect of a German blitzkrieg as demonstrated in Europe. With the primary assault scheduled for Friday, April 3, it was decided that the planned five-hour artillery bombardment in support of the direct assault would open at 10 am and continue nonstop until three in the afternoon, on the heels of which the tank and infantry would begin to roll forward. An hour before the ground action got under way, at 9 am, an estimated 196 Japanese artillery weapons, including 29 mortar and heavy batteries plus every close-support field piece available, would begin firing their guns, already registered on pre-selected targets. At the same time, Japanese aircraft, which by the end of the day would fly 150 sorties and drop an estimated 60 tons of bombs, would begin their assault on the chosen three-mile-wide U.S. front defended by the Philippine Army’s 21st and 41st Divisions. Ashton continued, “On this day, a large number of guns were zeroing in on us and the muzzle flashes were plain to see. Then at 10:00 am, a greatly increased bombardment [came] in waves, steadily creeping up the brow and along the top of Mt. Samat. It continued for five hours and surpassed anything of the like we had ever seen. At the same time the Nips sent over fleets of bombers … the explosions [of bombs along] with the whine of smaller strafing planes … was [sic] almost deafening. Communication lines and artillery positions were destroyed. Several acres of brush caught fire and burned fiercely. 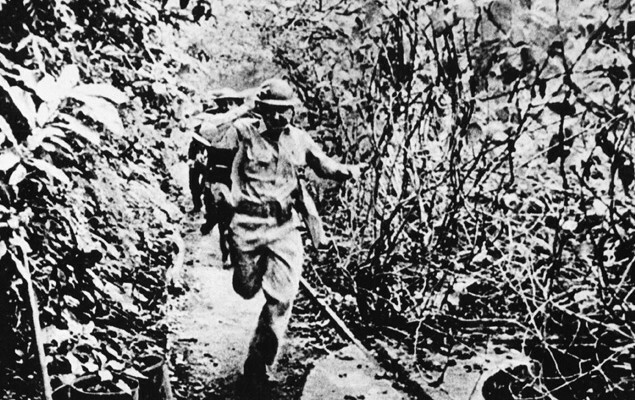 Rapidly displacing from one position to another, American soldiers rush along a jungle trail on the Bataan Peninsula. By the time the Philippines were completely under Japanese control, the victors had taken the largest number of prisoners surrendered to an enemy force in the history of the U.S. military. “It became worse with each hour.… I climbed the hill to the top of Samat for the last time to see what happened. I was amazed to see that the topography had changed. The trees were a jumbled mass of foliage; fire was burning the dry brush at the base and creeping up the front of the hill. A few bodies could be seen scattered along Trail 4, the main [withdrawal] route from the front, and groups of Japanese were fanned out everywhere. Although it may have seemed to those men along the II Corps front as though the entire line was being blasted simultaneously, the Japanese were actually directing the bulk of their air and artillery bombardment toward one specific point. Sector D, the westernmost portion of the II Corps’ area of responsibility and widest of the four sectors, stretched some three miles across the lower slopes of Mount Samat. Divided roughly in half, the defense of the sector was shared by two Philippine Army divisions, General Mateo Capinpin’s 21st Division on the east and General Vicente Lim’s 41st Division on the west. Both generals had assigned all three of their regiments to the line. General Lim had his in numerical order from left to right. The Japanese directed their assault at the 1,000-yard-wide defensive perimeter manned by the 42nd Infantry Regiment, 41st Division. Despite the initial pounding of the 42nd frontline positions by the Japanese artillery and aircraft, the Filipino soldiers of perhaps the toughest of the Philippine Army divisions on Bataan did not budge. After riding out over two hours of steady bombardment, the Americans and Filipinos paid little attention to the next squadron of enemy bombers that came over until the usual “freight train” roar of falling high explosives strangely did not occur. As the Filipino soldiers cautiously looked up from their holes to see what was happening, they saw what looked like hundreds of stick-like objects falling from the sky. When these sticks hit the ground, they burst into flame. They were firebombs, incendiaries. It was the end of the Philippine dry season. The flat lower slopes of Mount Samat were devoid of lush tropical jungle but overgrown by brush and dry clumps of bamboo and uncut sugar cane. It was not long before hundreds of small fires started by the incendiaries, fanned now by an afternoon breeze, merged into one. As the heat grew in intensity, men were flushed from their frontline positions back across a cratered, lunar-like landscape toward their regimental reserve line. 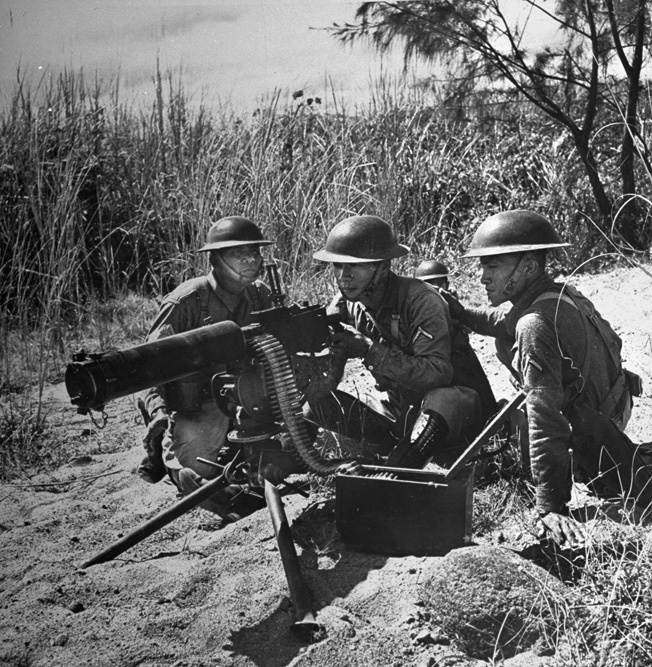 Although it was possible to outrun the fire, continued heavy Japanese artillery fire forced the Filipino soldiers to seek refuge in shell holes or abandoned foxholes along the way. Soon, there appeared to be no escape. Panic stricken, those who tried to outrun the fire were killed by the enemy artillery. Just as many of those who stayed to avoid the artillery burned to death. Filipino soldiers train with a heavy .30-caliber, water-cooled machine gun. The Filipinos often fought courageously in defense of their homes; however, neither they nor their American allies were prepared for the vicious Japanese onslaught that swept to victory in the spring of 1942. “At the height of the intense fire, incendiary bombs [were dropped],” he continued. “They came unannounced, going up with a silent blast that became hot, blinding fire that burned the woods and rendered our position insecure. [Soon] the fire was all around us and we couldn’t hold there anymore. We waited for an order from our C.P., but none came. At 3 pm, the line, masked in dense smoke and racked by steel and fire, was hit again. This time, General Akira Nara’s 65th Brigade supported by the 7th Tank Regiment attacked. The objective of Nara’s thrust was Trail 29—the feeder trail to 429, which, along with Trail 6 on the west and Trail 4 on the east side of Mount Samat, encircled the high ground. Like a rampaging river, the rout of the 42nd Infantry flowed into the 43rd Infantry on its right, carrying most of the 43rd with it. General Nara, who at best had expected to get only as far as the U.S. main line that day, surprisingly found a 1,600-yard-wide corridor completely abandoned to him when he arrived later that afternoon. At the same time, one mile to the east, the 4th Division’s 61st Infantry supported by a dozen tanks launched its attack against empty foxholes previously occupied by the men of the 43rd Infantry. When the battle subsided around 6 pm, nearly two-thirds of the enemy’s initial objective, the capture of the junction of Trail 6 and 429, had been accomplished. At the point where Trails 6 and 429 reached the backside of Samat, 429 turned eastward to connect with Trail 4. The Japanese were nearing their objective of cutting off Mount Samat from the rest of the Allied defensive positions. Buoyed by their unexpected success on the first day of the ground attack, the Japanese resumed the offensive at 6:30 the next morning with the same intensity as the day before. The Japanese kept the pressure on Mount Samat’s west slope and hit General Mateo Capinpin’s 21st Division on the Allied left wing. After a two-hour air and artillery bombardment, the 21st Infantry, westernmost of Capinpin’s three regiments, was hit by infantry and tanks of the 7th Tank Battalion. The Japanese ran rampant through the helpless Filipinos. By 9 am, less than three hours after the first bomb dropped, the Filipino 21st and 23rd Regiments were driven off the main line. The 22nd Infantry, positioned astride the access to Trail 4, was forced back an hour later. In less than a day and a half, the Filipinos had abandoned a three-mile-wide sector in front of Mount Samat. April 5 was the third day of General Homma’s anticipated 30-day offensive to capture Bataan. However, thanks to the effective blitzkrieg against Mount Samat, the Japanese were halfway home. The battle for Bataan would be over in six days. 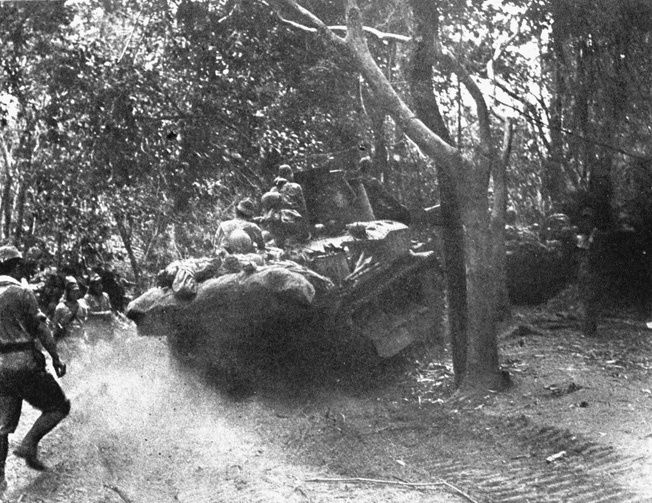 Japanese infantry and light tanks advance along a jungle trail on the Bataan Peninsula. The objective of the Japanese this Easter Sunday was the capture of Trail 4, thus completing the encirclement and isolation of Mount Samat, securing its heights, and allowing the capture of the entire Bataan Peninsula to proceed. After consolidating their seizure of Trails 6 and 429, the Japanese forces on the right began their assault on the western slope of the mountain. They found the going relatively easy. In fact, by 1 pm, less than three hours later, they had reached the heights. Before the Japanese gains could be consolidated, however, the stoutest defense so far was put up by U.S. artillery as accurate fire erupted from the guns of the 41st Field Artillery located on the south or reverse slope of the mountain. Until their forward observers were forced from their positions on the heights, the American artillerymen were able to direct fire from their Model 1917 British wooden-wheeled 75mm guns and old Vickers 2.95-inch pack howitzers. The defensive artillery fire held up the Japanese assault on Trail 4 until reinforcements arrived later that afternoon. By about 4:30 pm on April 5, with the capture of Mount Samat and control of Trails 429, 6, and 4, the Japanese had successfully executed their own version of the blitzkrieg. During the remainder of the Pacific War, they were never again presented with the opportunity to mount such an offensive against the Allies. When the Bataan Peninsula fell on April 9, 1942, the remnants of the American and Filipino defenders were forced to take refuge on the island of Corregidor in Manila Bay. Their days were numbered. General Homma was never credited with developing the tactics of the successful attack. His conquest of the Philippines had fallen behind the time table established by the high command in Tokyo. A more rapid operation had been anticipated following the three-month victory in Malaya and Singapore. The capture of the Philippines required six months of fighting, a sharp contrast to the lightning movement against Bataan. Following their victory on the Bataan Peninsula in the spring of 1942, Japanese soldiers raise their arms in a thunderous ‘Banzai!’ cheer. During the first six months of the war in the Pacific, the Japanese compiled an impressive string of victories. Donald Young writes from his home in Vista, California. He has done extensive research on the Pacific War with particular interest in the fighting in the Philippines. Tags Allies, Axis, Bataan Death March, Battle of Bataan, Edward King, General Masaharu Homma, Pacific Theater, Philippines.